Victorian dollhouse family in brunette. 1in to 1ft. 1:12 Scale. This is sized for a dollhouse. This set of four vinyl dolls; father, mother, daughter and baby will add a nice set to your miniature scene. Town Square Miniatures ~ Modern Dollhouse ~ My Family #00020 ~ New Sealed ~ Rare ~ Hard to Find! ~ Bendable & Poseable, Quality Clothing Designed Especially for You ~ Professionally Designed in the USA ~ The Quality Clothing will Remove Easily for any Outfit Change you may Need ~ The Package has some dents, but the Dolls are in Great Condition. Modern dollhouse family in brunette. 1:12 Scale. This is sized for a dollhouse. This set of four vinyl dolls; father, mother, daughter and baby will add a nice set to your miniature scene. Baby - 2"H.
Victorian dollhouse family with black hair. 1in to 1ft. 1:12 Scale. This is sized for a dollhouse. 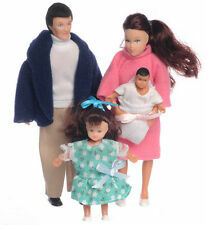 This set of four vinyl dolls; father, mother, daughter and baby will add a nice touch to your miniature scene. Modern dollhouse family. This set of four vinyl dolls; father, mother, daughter and baby will add a nice set to your miniature scene. 1:12 Scale. This is sized for a dollhouse. Father - 5-7/8"H. Baby - 2"H.
United Kingdom. Scale 12th. Rest of World. Type Family. Manufacturer: Aztec Imports Inc. Characteristics Set. Item Information. Characteristics Poseable. United Kingdom. Type Family. Rest of World. Manufacturer: Aztec Imports Inc. Characteristics Set. Item Information. Parental supervision is strongly advised. United Kingdom. Type Family. Rest of World. Manufacturer: Aztec Imports Inc. Characteristics Set. Item Information. Condition: New.